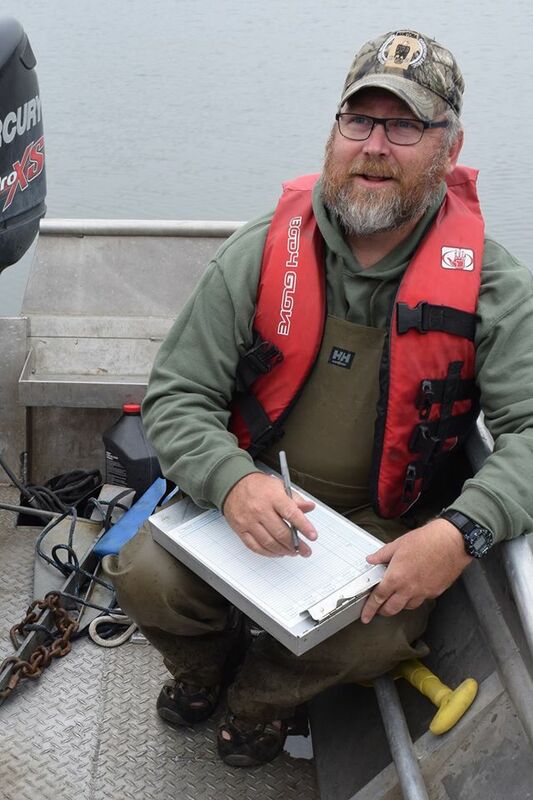 A couple weeks ago I noted that fall is a busy time for our fisheries division field biologists (Standard Surveys). I believe by now most of that field work has been finished, and now there will be some processing of samples and data followed by some report-writing in the coming winter months. 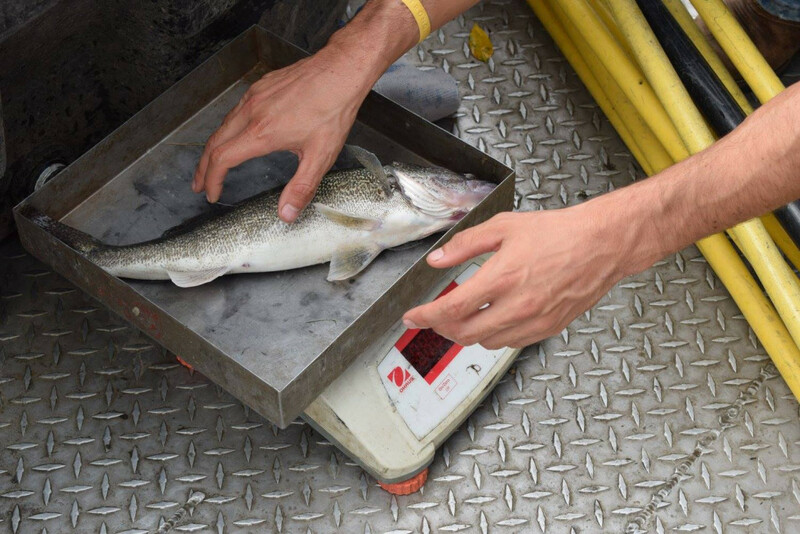 Last week I got an e-mail from Dr. Kevin Pope at the University of Nebraska-Lincoln reminding me that some of the students there got their hands fishy while helping do a couple of those fish population surveys this fall, Students Help Game and Parks collect fish data. 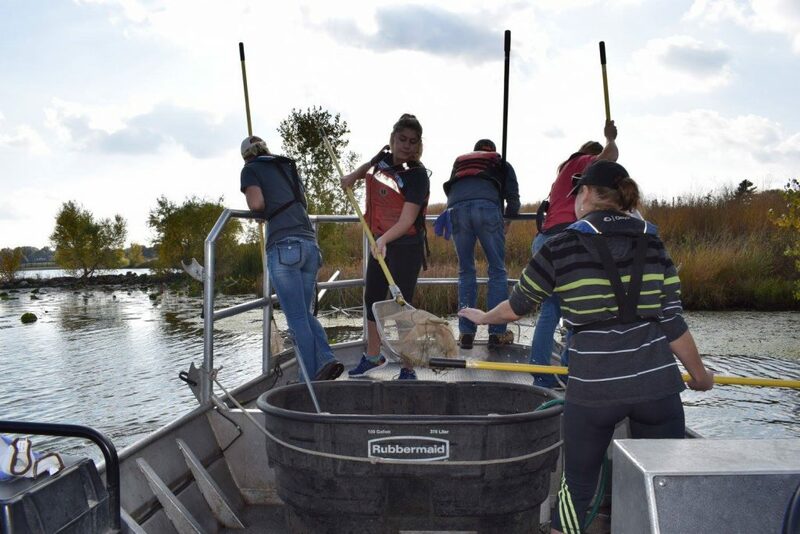 Here are some pictures they shared on FaceBook, UNL School of Natural Resources. All hands on deck, electrofishing. UN-L School of Natural Resources photo. Now you caught ’em, what to do with ’em? First measure the length. UN-L School of Natural Resources photo. Then weigh ’em. UN-L School of Natural Resources photo. 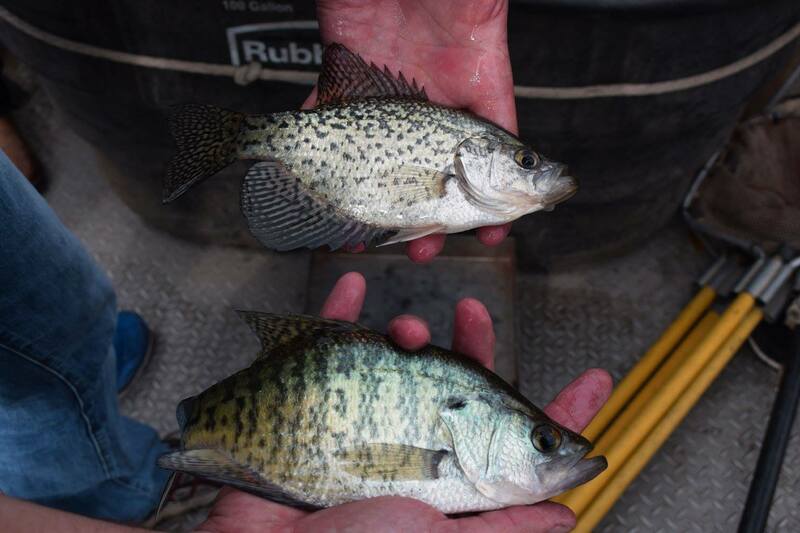 Time to practice a little fish identifcation; Black Crappie on top, White Crappie on bottom. UN-L School of Natural Resources photo. 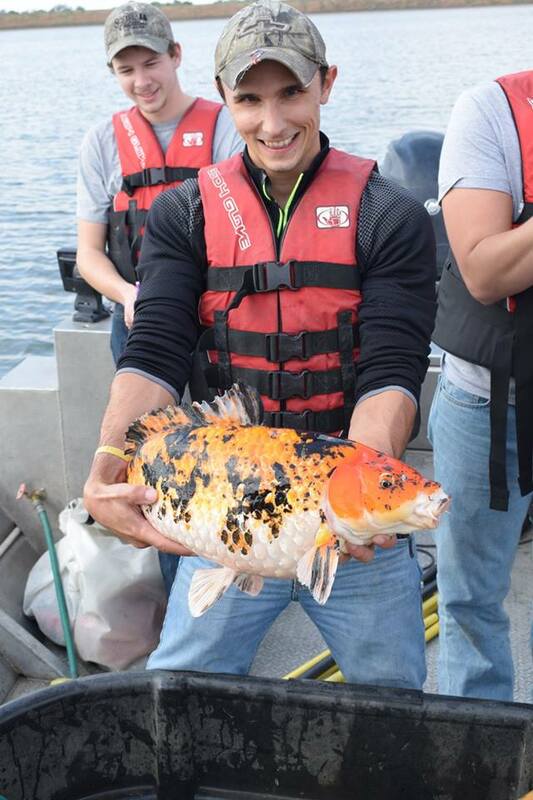 Yes, there are surprises, and often they are nothing you would have ever expected–like a Koi. 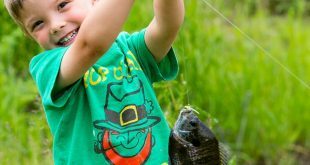 Wish folks would quit releasing their “pet” fish in our public waters! UN-L School of Natural Resources photo. Dr. Mark Pegg relegated to writing on data sheets (that way he got to keep his hands clean, ha). UN-L School of Natural Resources photo. Yes, there was a day when I and my co-workers were young college students eager for a chance to get some experience in the field. All the college book-learning is needed and very helpful, but then nothing beats experience. Now, it is rewarding to be able to interact with students from several Nebraska schools, and maybe help them learn a thing or two in the process. Oh, and thank you to all the students, and professors, for the assistance! I am often asked about my educational background and you bet, it included the University of Nebraska-Lincoln. GO BIG RED! 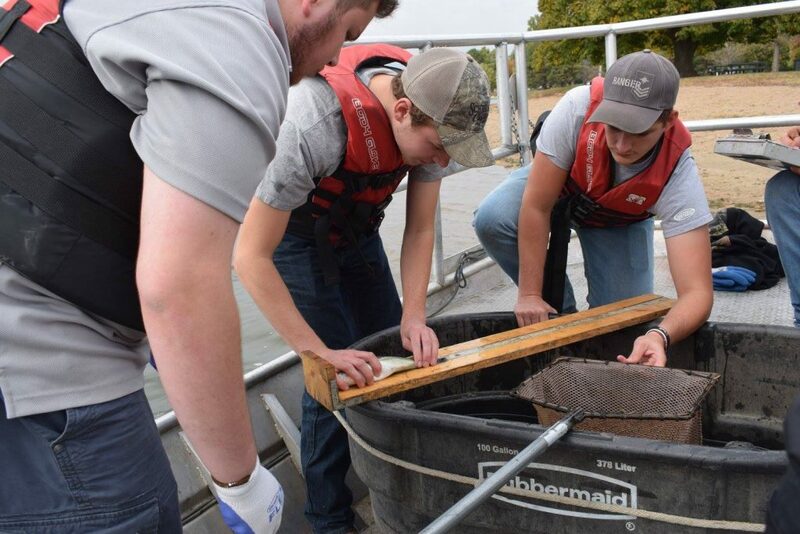 Check it out, University of Nebraska-Lincoln, School of Natural Resources.